AMEN Corner: Is It Okay To Preach About the "S" Word? 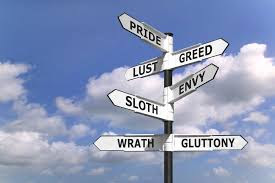 My Lutheran pastor friend and I were lamenting the other day that in many churches, sin is no longer talked about from the pulpit. I had read an interview of a pastor in a large east-coast church that is in my friend’s denomination. That pastor was saying that, last year, as the season of Lent approached, she realized that she no longer preached about sin. God convicted her to preach a whole series on sin during those Lenten Sundays. After a few weeks, a man came up to her and complained, “I don’t feel good about myself anymore when I listen to you but then I go home and listen to Joel Osteen and I feel better about myself.” That confirmed to her that she was doing the right thing! There is an old saying that preaching should “afflict the comfortable and comfort the afflicted” but too many preachers avoid the dreaded “S” word and preach only messages that entertain and sooth the soul and are then completely forgotten about later that Sunday afternoon. That “S” word–Sin–sparks raging debates among pastors in the Protestant traditions! They agree about the theological concept of sin. But many would strongly recommend that you don’t confront sinful behavior in sermons because you alienate the new believers and offend the mature members. Joel Osteen, was asked by Katie Couric why he doesn’t preach on sin. He said, “I don’t like to harp on those things. God is for everybody. And God loves everybody.” That is the unspoken theology of most megachurches and one nationally-known pastor, in an article on church growth, wrote that pastors who preach about sin are doomed to pastor small churches. Perhaps there’s some truth to that, but is healthy church growth “numerical,” or is healthy growth the body of Christ growing spiritually and becoming more like Jesus? If it’s the latter, then we’ve got to preach the “S” word. It’s as if God gives you 3 demerits for the sin of gossip but if you dropped a juicy bit of gossip while making it a “prayer request” for someone, you get three gold stars. You’ll get 5 demerits for lying, 7 for a lustful thought and 20 demerits for cheating on your income tax. But you’ll receive 1,500 demerits for sexual sins and 7,500 black marks for murder! We love this concept of the “sin scale” because we can then believe that our unrepentant petty sins are “no big deal” which is why we are so offended when the pastor puts those “safe” sins that we don’t do (murder, sexual sins) in the same category as the “minor sins” that we do commit. (gossip, gluttony, unforgiveness, astrology, greed, envy, pride, selfish ambition, ingratitude, arrogance, jealously, anger, lying, bitterness, boasting, slandering, impatience, backbiting..to name just a few) Those are the dangerous sins that we do daily in thought, word and deed. Dangerous because we pay no attention to them, and that’s why those are the ones that can get wedged between us and God until we confess and repent of them. But wait! Doesn’t God’s grace cover these? Isn’t repentance just some legalistic church rule? Some mainline preachers teach a universal theology that because God loves everybody, everyone is saved and there is nothing we need to do or even believe. But Lutheran theologian Dietrich Bonhoeffer condemned this theology as “cheap grace” and said “Cheap grace is the grace we bestow on ourselves. Cheap grace is the preaching of forgiveness without requiring repentance, baptism without church discipline, Communion without confession... Cheap grace is grace without discipleship, grace without the cross, grace without Jesus Christ, living and incarnate.” The fact is that Jesus requires repentance! Repentance is the continual turning away from sin. Jesus said that if you don’t repent and turn from your sins you will all perish. Luke 13:1-5 In the first church, Peter preaches that all must repent and be baptized Acts 2:38 and said you must repent and be converted that your sins may be blotted out. Acts 3:19 Paul says that God commands all to repent and turn from their sins. Acts 17:30 Jesus sent His disciples out to preach that people should repent and turn from their sin Mark 6:12 and so I too meddle in the lives of people and annoy them by preaching the same message about those minor, little, insignificant sins that I’m constantly preaching to the man in my bathroom mirror. This Lent is the perfect time for us to look within to see what are those “dangerous sins” that are coming between us and God.